This tableau depicting dolls observing toys coming alive at night is part of an exhibition called Dream On at the V and A Museum of Childhood. In the background are children's descriptions of their dreams with photos illustrating them. The exhibition is surreal and beautiful - and is suitable for both adults and children to go and see. I would recommend it if you are interested in the worlds of dreams and the imagination. It is free to get in and runs until January 2019. I have always been fascinated by dolls and toys and their associations with the magical and the fantastical - one of the reasons I wrote a book on Poppets and Magical Dolls. The Museum of Childhood also contains a few other magical dolls from around the world, which I will be blogging about in the future. 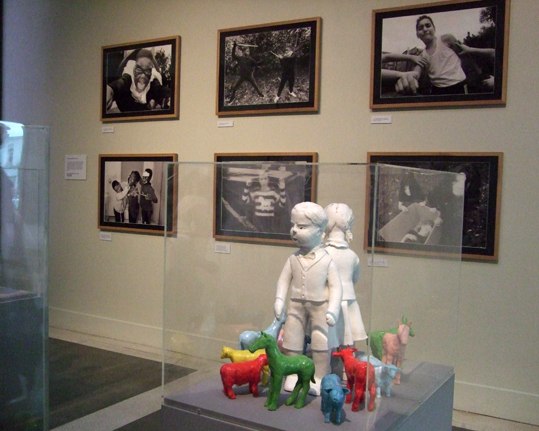 The Museum of Childhood is at Cambridge Heath Road, London E2 9PA. Admission is free.